Are you in need of exceptional legal representation in any of the following practice areas? You’ve come to the right place. 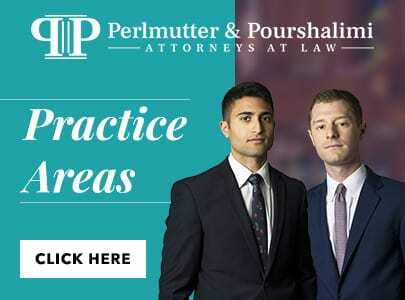 Perlmutter & Pourshalimi is dedicated to meeting your needs and exceeding your expectations with aggressive, client-focused representation. Criminal Defense: Every case is handled by an experienced former criminal prosecutor who knows the ins and outs of the justice system and has a passion to beat the system. Personal Injury: Have you suffered an injury or lost a loved one due to someone else’s negligence? Call an experienced personal injury attorney immediately to maximize your compensation. Employment Law: We serve a diverse clientele of employees in both state and federal courts. Our experience representing employees in a broad range of employment disputes gives you the advantage. Lemon Law: Does your vehicle have a problem the dealer just can’t fix? You might have a lemon. We can fight for the remedy you deserve, such as a buyback, a replacement vehicle, or a cash settlement. Landlord-Tenant Law: Our experience in landlord-tenant cases puts us in a unique position to understand the legal strengths to pursue, and weaknesses to avoid, in landlord-tenant lawsuits. Business Litigation: We represent clients in all phases of business disputes including pre-lawsuit planning, pre-trial litigation, motion practice and discovery, at trial, on appeal, and in post-judgment collection proceedings. At Perlmutter & Pourshalimi, we offer the best quality representation while keeping our fees fair and affordable. In fact, our fees are low compared to other firms because we want to make sure we get your repeat business, as well as new business from all the friends, family, and coworkers you’re going to tell about our services. We take select cases on a contingency fee basis, meaning you will have no obligation to pay until we win your case. When upfront payment is required, we offer flexible billing arrangements to make sure you get the representation you need right when you need it. For a free initial consultation, contact us at 310-295-2236 or fill out an online contact form now.